I just stumbled across this one, and once I stopped laughing, I realized what a genius idea it is! For years, the solution to wearing something a little too low-cut, was to add a camisole underneath. To cut the bulk, someone came upon the idea of putting a built-in bra into the top. Great idea, but the shelf bra doesn’t do much for a woman with a real bust, and there is still the extra layer of clothing to contend with. Soma Intimates solved the problem by introducing the “Cami-bra;” a bra with a layer of modest cleavage covering lace suitable for peeking out of your daytime dress or top. We’re all hunkered down in New York City, waiting for Hurricane Irene to arrive. For some reason, I got the urge to bake cookies, and of course discovered that I didn’t have the ingredients. They say genious comes from necessity, so I cobbled together something more out of boredom, than the desire to make the perfect cookie. Mix the first 5 ingredients well and stir in the chocolate chips. Drop the cookies on an ungreased cookie sheet, and flatten slightly with a wet fork. Cool on a rack and try not to eat them all in one sitting. I hope this Hurricane passes quickly and our recovery is swift, or we will be posting about diets next week! Keep safe and dry everyone! A few weeks ago, I lost a friend to a devastating disease. You may have read about her on this blog, the fearless fighter of cancer and founder of Cycle for Survival, a team studio cycling event that has raised over $9 million for the research and treatment of rare cancers. Jen was special to so many, due to her undying optimism, and attempt to face her fears and focus on living life to the fullest. She was an inspiration to so many that knew her personally, and those that knew her only from her blog “You Fearless“. She loved cycling, and celebrated her successes, both big and small with a happy dances that she shared via video. In honor of her extraordinary life, Kevin Garcia, of Lead Dog Marketing has embarked on the Fearless Tour, a 600 mile ride across California. 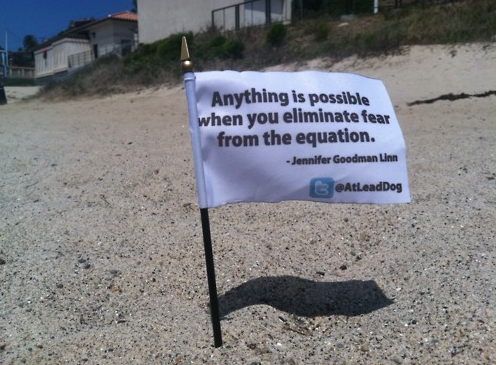 Every day they stop and plant a flag with an inspirational quote from Jen, and film a happy dance. Please take a moment to check out their Facebook page. For every “like“ they recieve, they will donate $1 to Cycle for Survival. 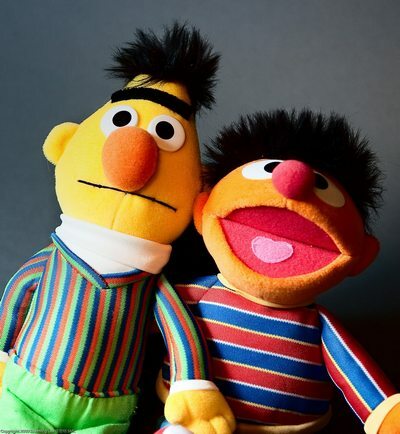 Betty Confidential and The New York Daily News report that there is a petition circulating to get Sesame Street to marry off Bert and Ernie. For years there has been speculation that the 2 male BFF’s who share a home, and a rubber ducky, have been gay. Over 3300 people have signed the petition promoting the idea of gay marriage and tolerance. Are you ever curious as to what other women your size look like? Enter MyBodyGallery.com, where women upload photos of themselves complete with information about their height, weight, clothing size and body type. Scan the gallery to see real women of all shapes and sizes and see how you fit in. This site isn’t meant to be competitive or derogatory; it is intended to give realistic views of what women look like at various heights and weights. Positive body image is key to self esteem, especially for young girls. My Body Gallery helps women see what they really look like, not what they think they should look like. Take a peek…you may be pleasantly surprised. Yesterday, B and I made homemade pasta and it was fantastic! It is not that difficult, and the results were definitely worth the effort. On a clean countertop, make a mound of 2 cups of flour and a teaspoon of salt. Make a well in the center, and crack 3 eggs into it. Using a fork, quickly scramble the eggs and flour until mixed. Knead the dough for about 10 minutes, until it is fully mixed and elastic. If the dough is too wet, add a little flour; if it is too dry, add a tiny amount of water and continue kneading until the consistancy is correct. This can also be done in the food processer. Cut the ball of dough into quarters, wrap each in plastic wrap, and let it sit for about 30 minutes. If you have a hand crank pasta machine, flatten one section slightly and put through the machine at the first setting. Fold it in half and repeat. Continue the process at each setting, until it is very thin. If the dough gets too long, cut it in half and roll each piece separately. Lightly flour the dough, and put it through the cutting blade. Gently separate the strands and put them on a tray. Lightly toss with the noodles with flour so they don’t stick together, and continue the process with the remaining dough. 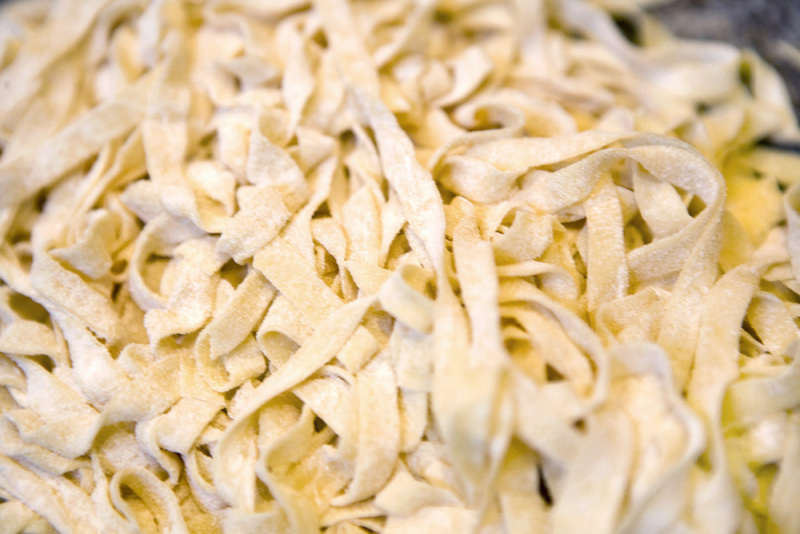 If you don’t have a pasta machine, roll the dough on a floured board until it is thin, and cut the strands with a knife. To cook, boil a large pot of water with a little olive oil. Cook the pasta for about 4 minutes, drain and enjoy with your favorite sauce!